Happy Friday to everyone, I have the perfect recipe for you to make this weekend. 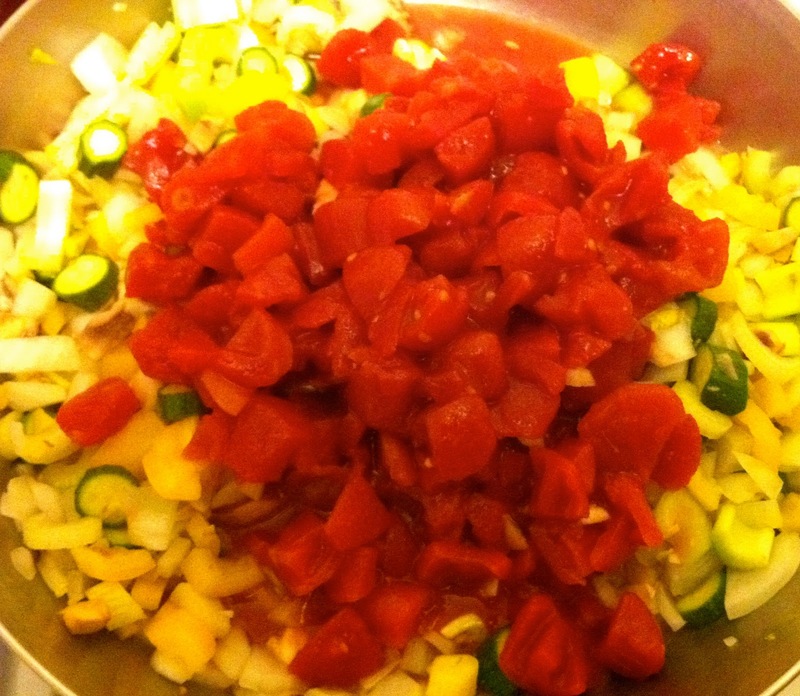 Yes, this is the Jambalaya recipe that I promised you all yesterday! There is a little story behind this vegetarian jambalaya. You see, there is restaurant in Dayton called Meadowlark. I went there with Mark and his family to celebrate my birthday and Mark's new job. 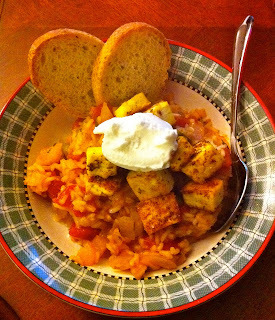 Long story short, Meadowlark had a fabulous vegetarian jambalaya filled with eggplant, squash, zucchini, and tofu! Lets just say that this is a dish that I knew I wanted to attempt to recreate and I think Mark and I got pretty close! Mark and I followed this recipe from Taste of Home. 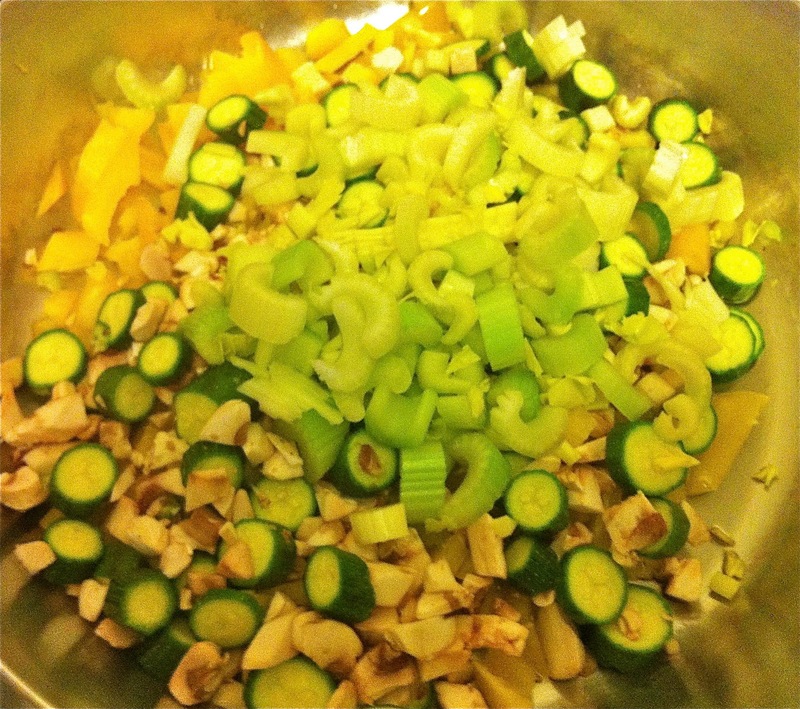 Next time I am going to substitute two cups of chicken broth for the two cups of water! Otherwise this recipe got a two thumbs up from Mark and I! First chop all your veggies, Mark and I rough chopped them. 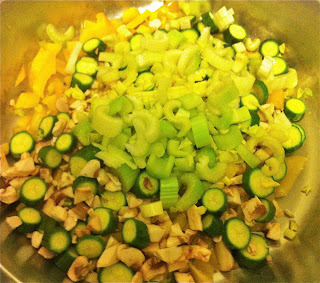 Heat the olive oil in a sauce pan and cook veggies until tender. Add your garlic and saute another minute. rice, water or chicken broth, soy sauce and the spices. Transfer your jambalaya to a 2 1/2 quart baking dish. Place in a pre heated 350 degree oven and bake for 65-70 minutes (or until rice is tender and most of the liquid is absorbed). Mark and I decided to bake chicken and tofu to top or veggie packed jambalaya with! It was delicious, I cannot wait to try this recipe again with chicken broth! Enjoy, Happy Friday and remember to live Happily Ever Healthy! Have you had a great dish at a restaurant that you have wanted to recreate? Have you been successful? This looks so good! Topped with some chicken would be the perfect dish! Have a wonderful weekend Hilliary! Okay this looks amazing. I need to find some inspiration in the kitchen. Been lacking lately. Although I don't have much of a spice tolerance... I've been working on it for a few years now!! MMMmmm yum, as always!! Have a great weekend! That looks so fantastic! And you are so right...the weather is getting crazy and it's gonna be cold, perfect for this recipe! This sounds so good! These kinds of dishes are exactly what my husband loves to eat - I'll have to make this for him!